Is your house standing on an earthquake faultline? UP and DOWN to navigate through the path of faultlines. My one long stitched-up version of the many faultline maps of Phivolcs which you can verify from its official site. Another one long map I painstakingly assembled from the fault trace located by nababaha.com on Google Map. While our only source of the MVFS are the maps from Phivolcs, this trace overlay of the faultline from my assembled Google Maps approximates the faultline of Phivolcs with a high level of accuracy. Bagong Silangan in Quezon City. where that is not covered by the maps. Village, Mary Hills Subdivision, and Life Home Subdivision. There. The cat’s out of the bag…. look at the problem in the eye and deal with our situation. This entry was posted in Earthquake, Natural Disaster, Uncategorized and tagged disaster, earthquake, east valley fault, epicenter, EXPOSING the Marikina Valley Faultline System, faultlines, large earthquake, list of subdivisions, magnitude, marikina, megaquakes, Natural Disaster, philippines, phivolcs, safety, tulisanes, west valley fault. Bookmark the permalink. 388 Responses to Is your house standing on an earthquake faultline? How different will the earthquake’s impact be on 2 high rise towers which are 2kilometers apart; i.e., tower 1 is 25meters away from the west valley fault line, and another is 2kms away from the west valley fault line? Hi sir..ang guitnang bayan san mateo po w/c in between ng west ang east valley fault maaring lumubog?or pag gumalaw po west,galaw din po yumg east? I am not a geologist. But gut feel tells me whatever forces created the VALLEY in the west and east valley fault lines, it can make a repeat of the ground dropping by an x number of meters. By the way, other than the east and west valley fault lines, there are other “UNTOLD CRACKS ON THE GROUND” near the area that once upon a time may have caused the wawa dam legend of Bernardo Carpio. Pls. see my post, ANTIPOLO: HIDDEN IN PLAIN SIGHT and pray to God for insight. Brgy..prinsa tereza rizal ay nasa fault po ba?? How far is Towerhils, Taytay, Rizal from the west/east/marikina valley fault line? please answer in (kilometers). Thank you. Is Pacita Complex 1, San Pedro Laguna on the west valley fault? I can’t find it in the map. Kasama po ba ang Bulihan sa West Valley Fault? Kung kasama po, saan po ang matatamaan? Salamat po! Are our houses in darimbang st., maharlika vill. taguig city and molave st., creekland pinagsama hagonoy is near or will be affected by this fault line? Can you please give me a map of it..thank you so much..
na sa fault line po ba lugar namin?? nasa gabihan area, 2nd avenue north signal po kami near creek….medyo naguguluhan po kasi ako sa mapa?? Good day po ask k lang po ksama po ba ang balintawak quezoncity s matatamaan ng fault line?dkp kc nakita ang balintawak s map.and if ever din po high,medium or low damage po ba ang balintawak? search this way please: Links and Maps. Im just surprised and same time curious on the changes made from the 2010 hazard map to the latest 2015 map. Wondering what geographical technology that phivolcs had been using to detect faults which are several kilometers deep from the surface?? It seems that the accuracy of finding these faults is almost the same as to when will the movements occur. I hope its not much like of predicting weather conditions made by Pag asa wherein typhoon movements or tracts are changing. So in 3 to 5 years from now, the assumption of Ayala ave all the way to SM Mall of Asia might as well be sitting directly under a fault may not be impossible. i understand we puny humans in the grand scheme of things cannot really have the gall to say WE KNOW BECAUSE WE ARE IN CONTROL. i guess close enough is good enough after realizing pinpointing fault lines cannot be an exact science. but i hope phivolcs reconsider its 5 meter buffer zone and maybe increase it to 15 meters instead, considering the always lingering thought of change the fault trace once who can stop them from changing it again. Thanks for replying Mr. Tulisanes. Your focus and patience in this important natural earth structure specifically on the west, east and southern areas of the NCR where majority of the inhabitants in the Philippines are present. With these scientific research and discoveries of the earth structure in connivance with Phivolcs creates serious awareness on the citizens of NCR and nearby provinces on the catasthropic danger of the East and West Valley faults may bring when it moves. Specially at present where this phenomenom are always in the news. Maybe you, Phivolcs and other experts can safely say that the fault networks are ONLY concentrated in the east, west and southern areas of NCR? good day sir kasama po ba sa faultine ang cogeo antipolo rizal ? Thank you for the information now we know what to expect at least when the time comes ” HOPE NOT” in Jesus name were very much prepared… more power to you!!! not exactly. dapat malakas talagang lindol na ang epicenter ay sa dagat nagmula ang maaaring magdulot ng tsunami. But please help me understand how Pio Felipe (now MRT Avenue) is like from the active fault line. Is it good, bad, or any term appropriate to describe its location (with regards to the active fault line). Hello po. Malapit po ba ang fault line sa heritage homes, trece marteres? hi. please check Avida Village Cerise Nuvali Laguna, it’s in barangay Canlubang. I heard the fault line runs through Canlubang golf and country club. How far is this from Avida Village Cerise? Hello, also have a house there, it’s approximately 12 to 15 km from our place. As long as our house is not standing directly above the fault I hope no major damage will occur. But the proximity of the fault line to our place will make the trembling much stronger. Sorry it’s 8 km only, malapit lapit the shaking could be strong enought to topple a structure that does not conform to building code standards, just like what the author is repeatedly emphasizing. Sir thank you for all the life saving information you’ve shared. I just want to ask how near is Eastwood Rodriguez Rizal in the danger zone. Should me and my family consider transferring to another place? Hi po. Nakatira po kami sa Sapang Palay San Jose del Monte, Bulacan.. tanong ko lang po gaano po ba kami kalapit sa faultline? Thank you very much. Hi po. Ang pateros po ba ay nsa fault line? Nasa barangay sta. Ana pateros po location ko… bago lang po kami dito kaya hindi ko mastado maintindihan kung kasama or hindi..
Hi Sir! I wanna ask if Golden City Binan Laguna is near the fault line? sorry di ko po maintindihan yung map 😦 thanks in advance. about 2.87 km from the fault line. Sir one oasis ortigas pasig city is near in fault line. Thanks! May I just ask where to see the list of danger zones, Mr. Tulisanes? Because you said in a comment that Brgy. Mambugan and Cupang are danger zones. Is this true sir? By the way, I already checked on the maps. Please respond as soon as possible sir, thank you. Extra question, sir. Do you think our house will hold or collapse? Because our house was built a long time ago, like maybe mid-90’s to 1980. But our house was renovated just a year or two ago. To be more specific, August 2013. Thanks! please get a practicing licensed architect or civil/structural engineer for expert advice. i’m being swamped with questions that i lose track of who asked what with the follow-up questions. by the “danger zones,” i think you’re referring to the areas WITHIN this region that our authorities seem to avoid discussing or at least identifying. but in case you haven’t yet read the post, read this first. at the end you’ll be face to face with the region again. Bukod po sa lindol, maaring masira ang dam. Ano po ang mga lugar ang magiging apektado kung nagkataon? Gaano kataas ang aasahang tubig? Taga Bagong Silangan po ako. Sa taytay rizal ilan po kaya ang intensity given the 7.2 magnitude from pasig city (where a nearest fault line passes) and is nearest to our place (we are about 100mtrs.from the taytay new public market). Thanks in advance for your reply sir. we don’t have to worry how strong is strong. it will be strong enough to collapse houses and buildings. make sure the structure you’re in when an earthquake happens conforms to national building codes and standards. Hi Sir. Yung Sampaguita Village po sa San Pedro, Laguna, gaano po kalapit? Tsaka po if gumalaw yung West Valley Fault, may posibilidad po bang maapektuhan yung East Valley Fault? dito dumaan ang fault line na malapit-lapit sa sampaguita village. Hi Sir. Thank you so much for the life saving information you’ve been imparting us. 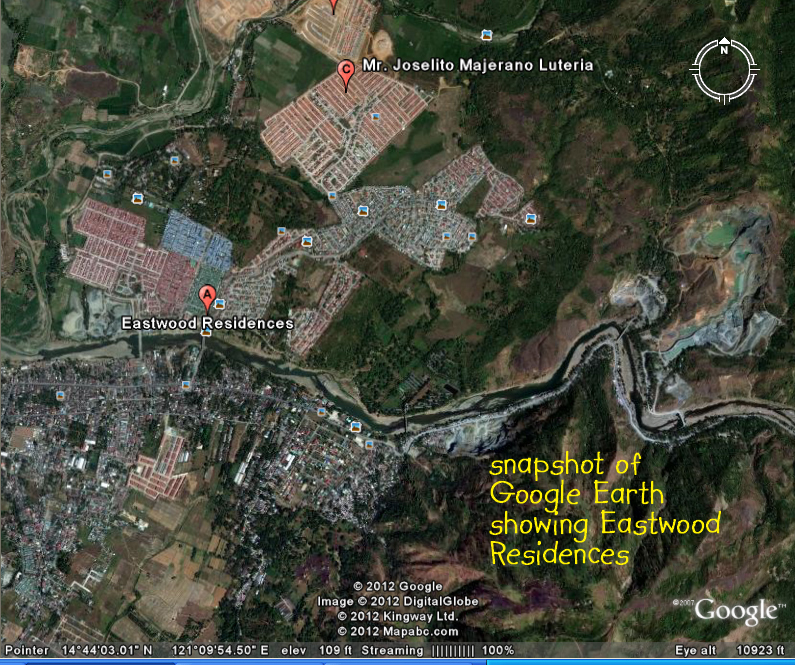 I would just want to know if how near Eastwood Rodriguez Rizal is in the fault line. Should me and my family consider transferring to another area? pls. refer to my answer to another comment found here. Hi Sir Were Located at Eastwood Residences Phase 8 San Isidro Rodriguez .Abot po ba kame ng fault line sir?salamat.kase po ang work ko dito sa Quezon City at nag wo worry po talaga ako sir kase di ko po Makita sa MAP.Maraming salamat po. Good day! Hi i would like to know if malolos bulacan is affected on the fault line? Thank you very much! i don’t know. but that is a legitimate concern. check phivolcs on that. hi po, helen po toh, ask q lng po kung maaapektuhan po ang habay bacoor cavite, dun po kasi nkatira ang pamilya ko.salamat po. How about in brgy.Milagrosa Calamba City?We are affected? How about in Soldier’s Hill Subdivision Brgy. Putatan, Muntinlupa? Can I know also where is the emergency evac in Muntinlupa. God bless to us….gusto ko lang po malaman kong sa Alfonso cavite po ba ay kasama sa malakas na ma apektuhan o gano po ba kalakas.Pls po pki inform po kc 3 palapag ang bahay ko at sa 2nd floor natutulog km ng mga anak ko..Gaano po kalakas yun…pls po para po alam namin kong safe po ba km o hinde..salamat..
Good evening sir! Salamat po sa infos. Taga Marikina po ako. At ang affected areas sa Marikina ay barangka, industrial valley, tumama at malanday. Kami po ay nakatira sa Sta. Elena, Marikina City, nasa delikadong lugar po ba kami in case mag ka earthquake. salamat po! medyo komplikado kung ipapaliwanag. may mapa naman po. bakit hindi nyo tsekin muna? about 1.18 kms from east valley fault; 2.10 kms from west valley fault. Tanong KO LNG po ang inaman st.masambong Quezon city maapektuhan earthquake. apektado po ba ang cembo makati? read my maps first, will you? Hi Sir! I would like to ask if the City Hall in Quezon City be affected by the earthquake? Thank you! faultline or no faultline under you, you are affected. the general rule is: if the structure above your head is very old or was not designed by a licensed architect and licensed structural or civil engineer, then you are nonetheless VERY MUCH affected as the structural integrity of the house or building may be weak, and the roof and walls can collapse. sir ask ko lng po if halang calamba lagina will affect the fault line.thanks and god bless. Hi sir! Area po ng NSTB boys town in Tanay Rizal…apektado rin po ba?nag aalala po kc me doon s anak ko..pls help give me some info..
no fault line in tanay. however, everyone is affected. again, the general rule is: if the structure above your head is very old or was not designed by a licensed architect and licensed structural or civil engineer, then you are nonetheless VERY MUCH affected as the structural integrity of the house or building may be weak, and the roof and walls can collapse. rough estimate, garden villas 3 is about 8.19 kms. from the nearest section of west valley fault. however, you should worry if the house they’re living would topple. the general rule is: if the structure above their heads is very old or was not designed by a licensed architect and licensed structural or civil engineer, then they are nonetheless VERY MUCH affected as the structural integrity of the house or building may be weak, and the roof and walls can collapse. Hello Mr. Tulisanes, I would like to ask if Brgy. Mambugan in Antipolo City is affected by the earthquake. If it is, will it be as strong as 7.2? Thanks! pls. read through this post. it may be one of the most important readings you will do in your lifetime (no kidding). can i ask a favor? can you please re-trace the steps i made for me to come to the apparent conclusion at the end of the post, and tell me that i’m right, or wrong? i’ve done some self-checking. i simply thought that a differing or just another point of view may be good for my soul. I’m sorry sir, but I didn’t understand the post. Can you please summarize it for me? And please tell me if Brgy. Mambugan will be heavily affected. Thank you sir. if it were, it will appear on the Links and Maps. pls. do some checking first. Hi! Will the City Hall in Quezon City be affected? Makatarungan St., Diliman, Q.C.? check first. then if you think you’re check mate, check me. ok? Kakukuha ko lang ng unit s Harmony Homes 2 bagong tinatayo subdivision malapit sa Total Gas Station San Pedro. The problem is nag start nako ng equity. Yun exact location po ba ng new harmony homes 2 ay affected? Salamat po! Harmony Homes 2 sir s san pedro laguna malapit s calendola po. Tpat ng total gas station. Sir Harmony Homes 2 located in San Pedro Laguna near Calendola Total Gas Station po. Thanks to check. Kasama po ba Bulihan silang, cavite? no, not on a faultline. Kasama po ba ang Bulihan Silang, Cavite? Hi im from Parañaque City (don galo),it seem like Parañaque is not indicated on the list,ano po ibig sabihin nun?or are we still affected?if we’re to be affected how much intensity we will be expecting? you don’t have to be atop a faultline to experience intense ground-shaking. the general rule is: if the structure above your head is very old or was not designed by a licensed architect and licensed structural or civil engineer, then you are nonetheless VERY MUCH affected as the structural integrity of the house or building may be weak, and the roof and walls can collapse. How about Kapayapaan Ville Canlubang Calamba City? Many thanks! i can’t find it. however, you can be affected without having a fault line underneath your house. the general rule is: if the structure above your head is very old or was not designed by a licensed architect and licensed structural or civil engineer, then you are nonetheless VERY MUCH affected as the structural integrity of the house or building may be weak, and the roof and walls can collapse. Thanks! Btw, how old is very old? Our house was built 2004.
how about way out in the back of the last century? Yun po bang Filinvest south Binan Laguna and Dela Paz Binan Laguna malapit sa West Valley Fault? Thanks in advance po. Would really appreciate any information. Carissa homes is about 20.31 kms from the nearest section of the fault line. however, although far, you cannot consider yourself safe yet. the general rule is: if the structure above your head is very old or was not designed by a licensed architect and licensed structural or civil engineer, then you are nonetheless VERY MUCH affected as the structural integrity of the house or building may be weak, and the roof and walls can collapse. Good afternoon! Thank you very much for this information. May I ask if Dasmarinas Cavite is close to the west fault line? no. from dasmarinas, the closest it can get to a section of the west valley fault is by SAN LAZARO RACE TRACK & CASINO FILIPINO in CARMONA, CAVITE. Hi po. Thanks po sa information na toh. ask ko lang po kung ang marilao po ay madadaanan ng fault line, nakatira po kasi ang family ko near sa san jose del monte,, particularly sa harmony hills subdivision.. yun lng po. thanks again..
harmony hills subdivision is 12 kms from the fault line. though it is far, the general rule is: if the structure above your head is very old or was not designed by a licensed architect and licensed structural or civil engineer, then you are nonetheless VERY MUCH affected as the structural integrity of the house or building may be weak, and the roof and walls can collapse. kaya ingat po! Hi. Nakatira po kme sa salawag dasma cavite. Affected po ba kami? Thanks po! though you may not live atop a fault line, you also are affected. the general rule is: if the structure above your head is very old or was not designed by a licensed architect and licensed structural or civil engineer, then you are nonetheless VERY MUCH affected as the structural integrity of the house or building may be weak, and the roof and walls can collapse. you did not specify exactly where in salawag, but from the ultra mega supermarket in paliparan 3, it’s 5.4 kms from the nearest fault line. you can calculate from there. Thank you, but I live in Aguho, Pateros, will I be affected? yes, being the general rule is: if the structure above your head is very old or was not designed by a licensed architect and licensed structural or civil engineer, then you are nonetheless VERY MUCH affected as the structural integrity of the house or building may be weak, and the roof and walls can collapse during a 7.2 magnitude earthquake. Hello, I am from Marikina. I’m just wondering if Parang,Marikina will be affected by the nearby quakes that’s gonna happen? If ever, how much casualties or how strong will the earthquake’s impact will be? you may be 4.62 kms from the fault line, but if the structure above your head is very old or was not designed by a licensed architect and licensed structural or civil engineer, then you are nonetheless VERY MUCH affected. gaano po kalakas if you are 4.6 away from the fault line? Hi, maaapektuhan po ba ang Sampaloc, Manila if ever gumalaw yung West Valley Fault? Sampaloc, Manila is far from the fault line. but if the structure above your head is very old or was not designed by a licensed architect and licensed structural or civil engineer, then you are nonetheless VERY MUCH affected as the structural integrity of the house or building may be weak, and the roof and walls can collapse. hi sir, we live at A. Mabini St West Rembo Makati, i work at Cityland Grand Central Residences in Shaw blvd the building is just across Starmall, then my daughter is studying at Hollistic Montessori in South Sikap Mandaluyong City, is it near the faultline? Pls help. Thank you! hollistic educational montessori center is about 3.45 kms from the faultline; starmall, 1.7 kms. but please note, generally, if the structure above your head is very old or was not designed by a licensed architect and licensed structural or civil engineer, then you are VERY MUCH affected as the structural integrity of the house or building may be weak and roof and walls may collapse. Hi sir…thank you so much for sharing this info…area of Talisay st.Comembo near in Benigno Aquinio high school are nearly affected? also Aims in pasay city and Tibagan high school in makati? Benigno Aquinio high school is about 0.31 kms from the fault line. the general rule is: if the structure above your head is very old or was not designed by a licensed architect and licensed structural or civil engineer, then you are nonetheless VERY MUCH affected as the structural integrity of the house or building may be weak and roof and walls may collapse. ang angono rizal po ba affected? naku! malayo po sa west valley fault. pero alamin n’yo na rin po. the general rule is: if the structure above your head is very old or was not designed by a licensed architect and licensed structural or civil engineer, then you are nonetheless VERY MUCH affected as the structural integrity of the house or building may be weak and roof and walls may collapse –KAHIT NA MALAYO PA KAYO SA WEST VALLEY FAULT. mag-ingat po! i think it just means putting any marker date to quantify if we are near or will have exceeded the 400 or 600 year mark. brgy. Talipapa Novaliches is about 7.65 kms from the fault line. but take note: if the structure above your head is very old or was not designed by a licensed architect and licensed structural or civil engineer, then you are nonetheless VERY MUCH affected and even in danger. ingat po! pls. try checking the maps first. thank you. Hi, is Chateau de Paris, South Forbes, Inchican, Silang, Cavite on top of the west valley fault? i can only locate inchican road which has the south forbes driving range at one end of the street. if this is familiar to you and we’re on the same page, that corner at the end of inchican road –where right across is the driving range, is exactly 1.00 km from the fault line, which is also the south west end or tip of the west valley fault. kung mahina ang tinitirhan niyo o ang mga katabing gusali nito, may posibilidad na may pagguho na mangyari at mabagsakan kayo (sorry to be brutally frank). kaya kumunsulta po sa LISENSYADONG arkitekto o structural/civil engineer na mapapayuhan kayo ng mabuti. hi, really the news are alarming, can you please help me find out it ibayo tipas taguig is part of the fault line ?. thank you very much ..
Hi sir! Is Sumulong Highway affected? I can’t seem to find our location. We are in First Street near Cherry Foodarama in Marcos Highway. as i have yet to be ready to share important information, i suggest that you visit the philippine geoportal and try to pinpoint your general area and learn what the DATA has to tell you. Thank you for taking the time to spread this information. Areas of qyezon city is at the fault line. Will this be near the area of new manila? Can you please explain this paragraph in simpler terms? What does this mean for residents of these communities? Is it very bad? sorry, if i sounded dark and serious. i think i just got carried away. that may have been from the early days when i created this blog. it was an attempt to describe the interesting twists and variations that the faultline changed to in the south. Thanks for the information by the way! Hi. re Mambugan and Cupang as mainly dangerous/disaster area in Antipolo when the big one occurs. Pls help me understand better. I clicked on the link you provided, but then again, I got stupefied by the map and found it very complex for a non-techie me to understand. Please, please, please. May I request you to elaborate on this, on as plain language as can be 🙂 thank you so much for your time, effort and concern. Cheers to you! actually, i don’t know if it’s going to be triggered by the big one, meaning mainly by the west valley fault. i suspect another fault line is involved that seems to be unnamed, unofficial, and which our authorities don’t seem to be tackling head on if not ignoring. however, by area it is found, we can call it the antipolo fault line, or TULISANES FAULT LINE, if our authorities don’t want to recognize it (just kidding). remember the ghostly green lines in the animation, that could be the killer fault line that i stumbled onto here. Thank you so much for your effort. I tried to look into the first three photographs where the subdivision I live in is, and I’m having a hard time figuring out if VISTA REAL CLASSICA (specifically Kingston Street) is directly above the West Faultline. This will be of much help, thank you! Kasali ba or malapit ba ang west rembo sa west valley fault line? If earthquake happens, where can we escape from our location? big help in raising public awareness. sad to say LGUs have not produced a risk reduction plan; no disaster mgmnt plan, nothing, nada. hay naku! for example, what abt the safety of the LRTs and its commuters? i live at cainta greenpark village across Sta. Lucia Mall; what could happen? how near are we frm the fault line? thanks for the reply. look about your concerns, i’ll post in the near future about a study on such things that a whistleblower once gave to me. abangan…. Good evening, sir, how about Amsterdam Street, Capitol Pak Homes, Q.C. 1121? How far us this from the faultline? is marikina height be affected as well? marikina heights just seems to be OUTSIDE the border (just above “masinag” and “cupang national high school”) where that red, broad area just doesn’t look right! please read this post to understand fully. Good day. May I ask if Loyola Heights, Xavierville, Katipinan area would likely be affected? Thank you. yes, in the sense that they all will feel the intensity of the shaking like everyone else in the metro. pray that you will be sheltered in a strong, stable structure when it happens. Hi! This site is very informative, thank you very much!! I didnt see our subdivision in your list of villages directly above the West Valley fault line nor did I see it on the maps but can I ask if Felicidad Village 3 in Brgy Banaba San Mateo Rizal will be affected? It’s somewhere near Puregold San Mateo. Or I’ve read somewhere that it is actually under the East Valley Fault? Thank you and God bless! Hi po. Itatanong ko po kung ang pateros ba ay kasama, kasi ay malapit ang pateros sa comembo. Barangay sta. Ana (kaliwa) pateros . check po muna ng mapa. salamat! Read everything here and all infos are very nice/informative. Thank you for bringing this up to our awareness. Now im a bit worried if our house and work place is near the fault line. im working in otis manila. Are we near po ba? no, it seems these places stay clear of the fault line. however, if your house or place of work wasn’t designed and constructed by a licensed architect or structural or civil engineer, or it’s an old, old house, then you have reason to worry for safety may be compromised. Pls refrain from calling it Marikina Valley Fault as it sends a wrong signal. That’s how they used to call it which is misleading. Actually only a small part of Marikina near its QC boundary will be affected. They have been shifted and been calling it “West Valley Fault” already in the last 5 years to spread awareness that it is not only the concern of the people in Marikina but in a lot more places in Metro Manila and Laguna. i’m quite aware of that. except for the title of my blog, i believe i have not been calling it the marikina fault line at all. if i remove “marikina” from the blog’s title, i may be losing a lot when search engines appears to have bookmarked my site as one that is the most visited. i think the PUBLIC IS WELL EDUCATED already on what to call the faultline. i’d like to think that the name “marikina fault line” is a relic of our past, at the time it was first found out, and is already a part of our national history. that’s all –it’s just a name now. however, a sweeping truth like that doesn’t make the situation of those living on top of it any less worrisome. Hello. I would like to commend you for coming up with this very informative, if a bit disconcerting website. You have really put in a lot of time and effort to this endeavor and I salute you. In the maps that you provided, I can’t quite make out where FTI complex is vis-a-vis the fault line. I hope you can help me figure it out as there is a residential development I am looking at there. Thank you and more power! please see reply in the post “Where on Earth? (for selected requests only).” thanks! Sir , kasama po ba sa fault lines ang Ospital ng Makati sa Pembo? ang ospital ng makati ay ligtas at di tinatawiran ng faultline. pero ang di kalayuang PAARALANG ELEMENTARYA NG PEMBO ay 20 to 25 meters lang ang layo (lapit!) sa west valley fault na nasa harapan lang nito. Sir sa Brgy.San Manuel San Jose del Monte bulacan po aabutin po ba ng faultline..in front of Colinas Verdes Residential? tulisanes, would you agree to take me on a tour of the fault line? i would like to stop along the way and lift these areas up to The Lord for protection. i would be much interested in hiring you for a private tour or part of a small group to envision the areas most affected areas in a boots on the ground type fashion. also, like how close are trinoma and ultra malls to fault lines? How about in Brgy. Pinyahan Quezon City? Are we affected? Hello po gaano po kalayo ang ampid 1 san mateo rizal sa marikina faultline? thank you po. Sir how about po sa may Tagaytay Road, Barandal, Calamba Laguna? My wife and I are planning to get a retirement house in the area. eastwood residences is about 1.25 km. from the nearest faultline. i can’t quite pinpoint the name of the place, but look up on google earth and you can see to the right of eastwood residences are some structures and what seems like a rectangular pool of water. the faultline hits the bottom corner of that pool coming from the river. Sir I’m from Soldiers Hills Village in Putatan.Abot po ba kami ng fault line?Phase 3 na po kami sa likod ng Ayala Village.And yung school ng anak ko sa Jaysonville Subd.sa Christ the King sa Putatan din po malapit sa muntinlupa national road.May fault line din po ba dun? How many kms is bonifacio heights away from the faultine? not clear. but if you mean the condo bonifacio heights residences, then it’s about 2 km away from the nearest faultline. Hi, is the san pablo city also a fault line? Or the Oro vista Marikina concepcion Uno? oro vista is about 2 km. from the nearest faultline. 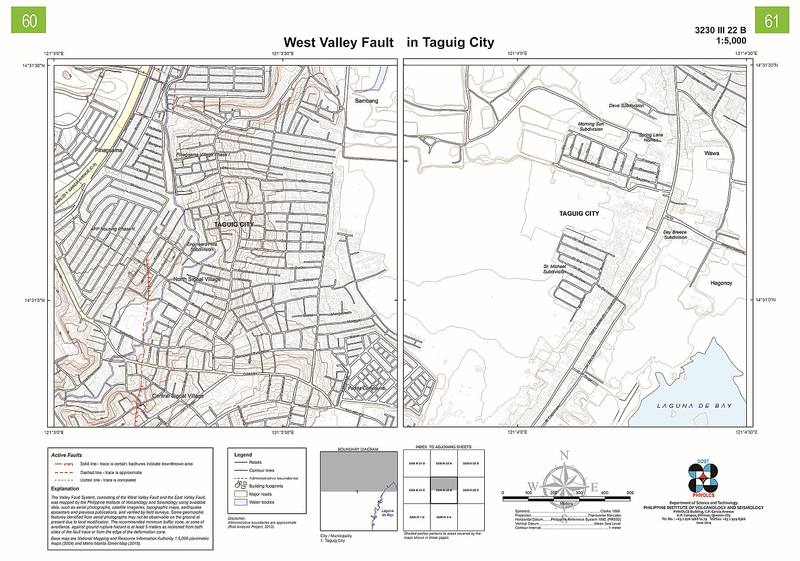 san pablo city is not affected by the west valley fault –but maybe by some other faultline or is near thereof. These are very much informative. Question po, we are living in cavite, imus to be exact. affected po ba pati mga lugar sa Cavite? Thank you very much. imus is far. before you get to the faultline, you have to cross muntinlupa. but you still have to worry about how strong your house is. if it was built without the help and expertise of a licensed architect or civil or structural engineer, then you may have the roof and walls collapsing when (not if) the west valley fault moves. Thank you for a very informative data and maps you shared to us. Well done and God Bless. I appreciate the comment. Be safe in God’s care. sandoval avenue would be about 3.6 km. from the nearest faultline; pioneer st. would be about 1.5 km. my house is located at francis ville subdivision mambugan antipolo city , are we affected by the marikina fault line ? no, but your house must be structurally stable. remember: quakes don’t kill; collapsing structures do. though francis ville is relatively far from the faultline, antipolo is in a bad light with regard to having the greatest number of fatalities (one may interpret that as deaths and injuries), as projected from the 2013 AusAid Hazard Maps Study which data you should be able to access here. to be fair, it appears barangay cupang MAINLY and mambugan in antipolo are marked as real danger zones. Thank you for your effort in spreading awareness and for patiently answering the questions of those who have read your article. I just want to know if you have any information on the areas where landslides are likely to happen. My kids go to school in don vicente street in filinvest 2 and my folks live in penafrancia street in payatas. I am very concerned about the possibility of landslide in our area because of the steep roads and slopes. Please advise if that is a threat, aside from the possible collapse of structures and fire in our area. Additional information will be highly appreciated. No. There is no extended map. You just have discern the general direction the fault traverses and hope your home doesn’t lie in its path. however, PHIVOLCS may have an updated map. pls. go and ask them, and kindly inform me if they do have “extended maps.” thank you! yung EAST REMBO ba kasama ba sa West Valley Fault? Thanks po..
the fault lines are shown where they lie. there can be no fault lines in your area if you do not belong to the communities identified to have these fault lines. how near or far you are from these fault lines depends on your proximity to and how familiar you are of these communities. PLEASE REVIEW WELL THE LINKS AND MAPS section. if you are nowhere near these communities, chances are you are nowhere a fault line; or if you are near, next to, or situated within these communities, the house or building you are concerned about will show on the maps. i will trace any location only if i see a real reason for concern. however, where there is always the possibility of other fault lines that are not covered by my blog, PLEASE CONSULT PHIVOLCS for any such information. thank you! yes. yung EAST REMBO kasama sa West Valley Fault. the fault lines are shown where they lie. there can be no fault lines in your area if you do not belong to the communities identified to have these fault lines. how near or far you are from these fault lines depends on your proximity to and how familiar you are of these communities. (Rodmar!) PLEASE REVIEW WELL THE LINKS AND MAPS section. if you are nowhere near these communities, chances are you are nowhere a fault line; or if you are near, next to, or situated within these communities, the house or building you are concerned about will show on the maps. i will trace any location only if i see a real reason for concern. however, where there is always the possibility of other fault lines that are not covered by my blog, PLEASE CONSULT PHIVOLCS for any such information. thank you! i am quite aware of your concern. it once crossed my mind that if the MANILA TRENCH (from far off and beyond the manila bay) moves, any tsunami it will generate is directed towards the shores along the long span of roxas blvd. my fear then was if it swept the luneta park when thousands of people were dotting the landscape, i don’t think there are enough nearby high rise buildings or at least two storey establishments where crowds of panicking souls can rush to. BUT HOLD ON, I READ SOMEWHERE INFORMATION RELEASED BY PHIVOLCS THAT IF THE MANILA TRENCH MOVES AND PRODUCES A TSUNAMI, THERE WOULD ONLY BE ABOUT KNEE DEEP OF WATER THAT WILL BE RUSHING INWARD FROM MANILA BAY …now i just hope phivolcs comes out with official pronouncement confirming this information. but hey, it’s not far-fetch to imagine a tsunami sweeping luneta park! how about project 8 qc, sangandaan qc, project 6 qc bago bantay and project 7. tandang sora near UP and tandang sora going to valenzuela city? searching for pamahay village on google earth, somebody from blk. 12 lot 12 of pamahay village is identified. from there to the last identified point where the east valley fault seemingly terminates, the distance is 3.6 km. 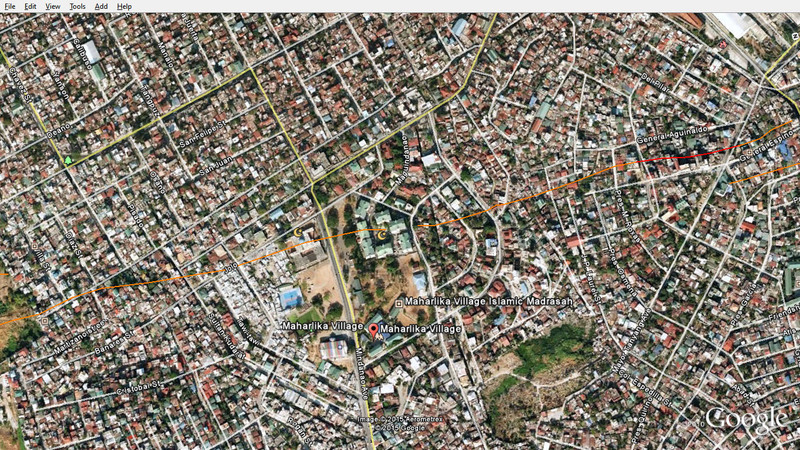 Hi, our office is located at Meralco Ave. near St. Paul Pasig, how far is it from the fault line? My husband’s office is located at Vergara, Mandaluyong City, how far is it from the fault line? Are we safe in our workplace? Thanks, hoping you can reply soon. have you checked What about Ortigas District? Is it near Rd 20? Particularly Gsis village? How about the U-belt? binan, laguna at the intersection of SLEX and greenfield parkway is about 4.41 km. from the nearest faultline. lower taguig lies after the point where the faultline seems to disappear (just before cuasay road in central signal village) and to reappear in the sucat thermal plant to continue on to tagaytay. this is about a 6.9 km. break in the west valley fault where your area is part of. Is Renaissance Condominium along Meralco Avenue, Ortigas Center, Pasig City part of the fault line? renaissance tower condo is about 0.58 km. from the nearest faultline. Hi! I live in Taguig. May I know if EP Housing Phase 1 in Barangay Pinagsama (formerly Western Bicutan) lies near a faultline? We are near The Heritage Park. Will appreciate your reply. ep village phase 1 covered court is about 1.11 km. from the nearest faultline. Hi! We live in Greenland subdivision, Nangka Marikina. How far is it from the nearest fault line? the west valley fault runs on the other side of the marikina river from greenland subdivision; touching the border of ayala heights right about on the corner of london avenue and katipunan extension. wow i just freaked out to know that just outside our house is a fault line. we live in matthew street filinvest quezon city like literally 10 steps from our house. our house is bungalow i hope our house is strong enough. godbless us all. thanks to the author good job. Hello, i’m familiar with the stoplight at greenmeadows and ortigas ext. cause i usually take that route going home. My house is near Ligaya along Marcos Hiway in Pasig. I hope the fault line doesnt cross there. I googled this post since there was a 5.7 magnitude in batangas in which i also felt here in Pasig. Kudos to your article! Hi, is AFPOVAI in Fort Bonifacio or Capitol 8 safe to live in or is too near the fault line? Thanks! i checked and AFPOVAI in Fort Bonifacio is about 1.22 km away from the nearest path of the west valley fault. depending on pinpointing exactly the borders of marikina heights, from the nearest section of the faultline in loyola grand villas, it’s about 3.2 km average; or from st. scholastica’s academy in your area, it’s 2.7 km. the libingan ng bayani main gate is about 1.25 km. from the nearest faultline. Appreciate your advise. Thanks in advance. Just to complete the address where our house sits, Guadalupe Nuevo, Makati City. 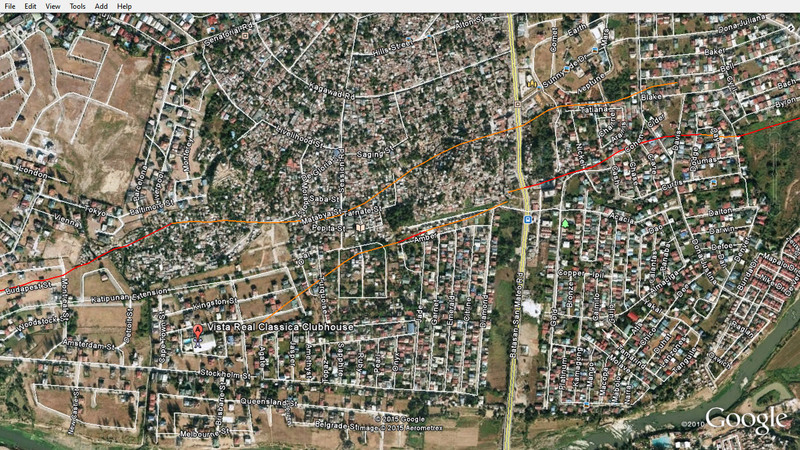 Are our houses in Guadalupe Nuevo and BF Resort Vilage, Las Pinas near or will be affected by this fault line? how about highland pointe havila? It’s is near in san beda taytay. far. nearest fault passes under and before coming to the traffic light at the corner of green meadows avenue and ortigas extension. Hi.. I just wanna know i am planning to buy a house and lot in brgy.bagumbayan,teresa rizal is this place is in active faultline? teresa, rizal is far from the west valley fault; and if there is a fault line there, it’s not part of the west valley fault. sir I live in Industrial Valley.. I just wanna know if Bougainvillae/Bonggavilla St. sits under a fault line.. we have a 3 storey house.. scary.. Thanks for informing us..
i can’t find Bougainvillae/Bonggavilla St. among the street names in the satellite view of industrial valley. but it seems to be in an area where names of flowers dominate and lie alongside one another, like waling-waling, yellowbell, marigold, camella and petunia streets. as far as i can tell, the faultline crosses none of these! rather the zodiac streets with the names libra, capricorn, virgo, scorpio, cancer, gemini, aquarius and taurus are targeted victims of the west valley fault. This is so scary because we live in Filinvest Heights Subdivision in Bagong Silangan. Looking at the map our house is just about 100 meters away from the faultline. cavite or bulacan,,,? not part of the fault line? officially, philvolcs say that the west valley fault starts from the sierra madre and runs through carmona, cavite. from what i can gather, from the VISIBLE outline of the faultline on satellite map as determined by the national institute of geological sciences at nababaha.com, it seems to run only from laguna to montalban. but take phivolcs word for it –they’re the experts! i just may need new reading glasses. This article is truly an eye-opener. Like what the page says, it’s bad enough that the faultline exists; but it’s worse when you’re clueless where. So all we can do is be informed. Kudos to you Tulisanes. I would like to know how much will we be affected if we experience a 7.2 magnitude earthquake? I live in Brgy Fortune, Marikina and its quite near the fault line. What should we expect? Is there a safe distance from the fault line? I’ve read that it would have more effect on buildings. But what about for houses? Is there a safe distance where the effects would be minimal? look hard and with serious intent and try to realize what the highlighted slides are telling. the data are telling more than what we are prepared to ask. Sir, ano po kapag dash line? i figured the faultline, specially the west valley fault, was determined obviously by some sophisticated, state-of-the-art technology that we just have to have faith in. from what ground impressions of topography through patterns seen and directions made out that a graphic representation was created in the form of a red line. in other words, there are areas that have long solid red lines which tell the faultline that runs there is unmistakable –beyond shadow of a doubt! however, there are areas that appear to hide the faultline underneath (no obvious cracks at a glance, so to speak), and traces could be seen here and there, and the repetition of the “here and there” are what creates these dash lines. but make no mistake, these dash lines can mean the earth underneath can rip apart should a quake strong enough like a 7.2 magnitude hit! if how i stand at this point in time is judged as revealing half the truth, then it is but a snapshot of a dynamic and evolving truth that had triumphed from being kept in the dark like the many who visit this blog and are NOW being awakened from their cradle of ignorance. simply put, people are being given a chance to avoid making the I-DON’T-KNOW-BECAUSE-NOBODY-TOLD-ME lame excuse! information like what you bring can contribute to and enrich that truth and help in every personal and individual decision-making that can save lives and, perhaps, lower the estimated death count of 37,000 as projected in a 2013 AusAid Hazard Maps Study. “personal and individual” because each one should be given a chance to decide for himself and his family and not by some others who wish to play god over the destiny of the majority, no matter how good-meaning their intentions may be. what i present in this blog are not new. the information has been there all along. ineptness or inefficiency to deliver and communicate this life-saving information can be forgivable. but to deliberately withhold information is deadly sin. my role is to generate awareness, and with a fair amount of responsibility at that. by the way, that “half the truth” you find missing and try to fill in with your short but concise comment (thank you for providing emphasis on the subject) has already been addressed comprehensively by an expert in my special post here. generally, whenever asked, i always advise to consult a structural engineer when in doubt if a house or building can withstand an earthquake. i must disagree, however, with your last remark that seem to belittle the danger of being housed directly atop a faultline. it must be remembered that the july 16, 1990 luzon killer earthquake “produced a 125-kilometer ground rupture that stretched from dingalan, aurora to kayapa, nueva ecija, movements along the philippine fault and digdig fault.” getting a cue from that, it means that if your house is standing directly atop the marikina valley faultline, no matter how strong and reinforced its structures may be, there is the danger of the house being shredded mercilessly like dry crackers. i live in a high-tower condo in eastwood. they say that this building is fairnly new although im not sure what year it was built. is the building safe? can you tell me the scale of danger that the building is in. i understand it is near the valley fault so some people can automatically answer that this bldg will be shred to rubble, but there are other engineers that said high tower condo are least vulnerable compared to residential buildings. i just want to assess my situation of the danger in an accurate way. How about is mandaluyong area po??? is there an active fault line below or near mandaluyong??? Thanks!! mandaluyong? none that i know of. Sir how about in san jose del monte bulacan? the distance from san jose del monte city hall to the junction of the three-pronged fork at one end of the west valley fault in the north is about 11 kilometers. it’s far relatively. But I gather that the fault line lies up to La Mesa and Angat dam which is extremely dangerous for the nearby San Jose Del Monte Bulacan residents. If the West Valley Fault-line moves that will be a terrible terrible disaster that we can not even imagine. You know, there may be debunkers out there who would say “just about anyone can speculate” or “anyone is entitled to his or her opinion,” but i still have to hear someone in authority to actually debunk these kind of scenarios. the problem is, things to them appear to be hush-hush, while at the same time projecting they are on top of a situation which they ain’t fully telling what! in other words, you may have something there, omar…. Well done, Mr. Tulisanes. You should be commended for your exhaustive work. We live in Mandaluyong, beside the Pasig River beside the Makati-Mandaluyong bridge. How many kilometers would you say we are to the nearest “hit” along the Marikina West Valley Fault? Thanks ever! call it coincidence or synchronicity or just good geometry, but if you were standing midway of the makati-mandaluyong bridge, the distance is 3.8 kilometers to midway of the c-5 bridge, where the west valley fault intersects through and runs perpendicular towards the direction of the makati-mandaluyong bridge. I admire your initiative and passion to spread awareness to people and your commitment to even reply to most of the questions posted here. I also read few readers who still find reasons to argue rather than contribute to this advocacy and instead of attacking you still replied objectively with respect and rebutted with utmost professionalism. I like that. Thank you for doing what you’re doing!! Godbless!! keep it up!! thanks, that encouragement is refreshing and much needed! so people can appreciate… yesterday, this blog received a record-breaking 16,378 visitors, and 84 visitors have asked for my comments. why i’m doing this? every now and then i ask that myself. May I ask Sir, it was mentioned previously that the fault line goes all the way to Tagaytay, right? So it will come across places in Cavite for sure (God forbid) that were not mentioned in the list of danger zones… I am trying my best to identify the danger zones myself but I sad to say, I am a little technologically challenged than most of your readers are… Would you be so kind as to give us some details on what places in Cavite this fault line might hit? Again, thank you very much sir for this post… God bless you…. Either Sampaloc/Sta. Mesa area of Metro Manila is far from the fault line or I may have just missed it in my browsing. the west valley fault missed the sampaloc/sta. mesa area by several kilometers. however, i advise you to look into some selected slides from the presentation “MMEIRS Scenario 8: Magnitude 7.2 Earthquake along the West Valley Fault System by JANE T. PUNONGBAYAN, Ph.D.” for critical data like building damage, quake intensity, deaths, liquefaction, fire spread, etc. that will affect targeted areas in metro manila even though far away geographically from the east and west valley faults. please see my addition to post WHERE ON EARTH? (FOR SELECTED REQUESTS ONLY). link is on top right column. go there and scroll to your request. Thank you so much for this. It’s a great tool for people to plan for the future. How about the Calamba City, Laguna area? Hello, we bought a condo unit at veritown fort bonifacio global city, is this area part of the fault line? If not, how far is it from the fault line? Katipunan Avenue will not be spared? Thanks for the information. Very insightful. Scary but true. It’s amazing how property developers still continue doing their thing even if the warnings are all over. Then again, it’s the government or LGUs who should have the last say on these building permits. May wisdom move them before the fault line’s. I was just wandering where there any mention that the fault moved between 1200 and 1400. What made philvolc say that it moves every 200 to 400 years. Kudos,Great piece of information. But, your “fear” in condo living or in high rise structures may not be that accurate in my opinion. A Japanese government-funded study of the said fault line indicated that, of the estimated 45% buildings expected to collapse in a major earthquake, 85% of which are low to medium rise structures. In fact, even in the Kobe earthquake, no high rise (30 floors up) structure had collapsed. The logic to this are: 1..Most of the older structures are low rise structures and most were not covered by an existing building code. Evident of this are the collapsed century old churches in Bohol where such structures have no steel reinforcements. Even those newer low rise building are more prone to destruction as building code enforcement are not heeded in that level especially in some local government areas where “renovations” are the common excuse for not getting a building permit. The pictures of collapse structures in Haiti clearly shows those buildings were constructed in sub standard manner where steel reinforcement are so visibly sparse and in some cases, lacking or non-existent. 2. High rise structures tend to “sway” with the earthquake wave compared to stiffer low rise buildings. Its a realization in the structural engineering community in the last 25 years that structures must be built to sway with and not built to fight such violent movement of the earth. While quality of materials, strong foundation, solid bedrock, and good quality workmanship contributes to a stronger structure; the design of such building should be one that can sway with the shaking. 3.High rise buildings’ foundations are anchored to solid bedrocks as compared to low rise building where foundation footings are the only requirement thus making them more vulnerable to soil liquefaction and subsequent collapse. But then, its not just collapsed structures that kills. More deaths usually occurs during panic. If in the event of a strong earthquake happens when one is in the 4oth floor, there is no need to rush down the crowded stairways where injuries and even death is of high probability. There is no question that the Valley Fault Line will certainly move and it may be a strong earthquake, an informed populace can react in a way that it can weather the violent shaking. God bless us all. Thanks for the info, Alex. I recently invested in a high-rise condo by the Pasig river (Mandaluyong side). Is it safe to say that the building is anchored on a solid bedrock? Quite worried of the possible effect of liquefaction as the property is proximate to the river (about 100m off the riverbank). there is data on liquefaction potential from the same japanese-funded study. i studied the relevant slide, and i noticed that the three or four red dots at center that seem like a belt that connects the blotches of colors at their left and right –this is the pasig river on mandaluyong side, with the color red in the legend signifying high liquefaction potential. however, it seems the dots say that only particular small areas are affected. i’m not sure, so you have to double-check. “sway with the shaking,” that is much like rolling with the punches. i like that! may i share an earthquake docu from japan that i watched where putting a simple steel brace, or a kind of diagonal long metal, near the junction of a concrete post and the beams that it supports spells a lot of difference. with the normal construction of posts and beam, a simulated earthquake transforms the building frame into wobbling jelly or like grasskirt swaying to a hula. but with these braces, the structure did not sway at all like it was one solid piece! when you said “sway,” that was the word my office mates used to describe the few seconds they were trying to survive on an 8th floor of a building during the july 16, 1990 earthquake. it seemed the higher one’s elevation when the shaking started, the more tossing to and fro there is in the building. i was on a street then walking and i just watched a 60 foot meralco pole slither upwards like a snake that suddenly grew curves, and the electric lines were going up and down like crazy as if doing skipping ropes. but with my foot planted solid on the ground, it felt like becoming dizzy and losing balance and trying to stay up. it’s really something when one puts faith in technology and the technology stands up to it and delivers. personally, as human instinct would have it, when the shaking starts one makes a quick judgment whether the time it takes to find cover in a secure spot is about the same as when one decides instead to head out the door and into the open. to feel secure, i’d rather have clear skies above me within short seconds, where nothing could be falling. being on a 40-storey building and hoping that the promise of technology holds up that no structural collapse happens, and with using an elevator a big no-no during an earthquake, the probability of seeing clear blue skies outside anytime soon won’t be happening. maybe it’s just me, but when on a 40th floor and the residents going in panic is a given thing, after the initial STRONG tremor, i would rather do something and go down and head out of the lobby door in a zip than just stay inside and meditate on the promise of a brochure that a state-of-the-art engineering was use to erect the high-rise building –so nothing to worry. but hey, it’s just conservative me who won’t go out on a limb and be daring to put faith in technology! on a final note, thank God that modern-day engineering keeps getting better and better. however, i tend to think that they hold up to keep us safe longer but not forever. i think of the 911 twin towers where many who evacuated through the long flight of stairs survived than those who opted to stay inside their offices. (i know it’s not fair comparing apples to oranges, but though the CAUSES are different, i find similarity in the EFFECT they impose on the structural integrity of a building). Praise the Lord! for all the calamities that are happening around us. “Praise the Lord!! !” – !!! SERIOUSLY??? please see post made on TAGUIG, PEMBO, COMEMBO, EAST REMBO, BAGONG ILOG, AND ORANBO. link is on top right column. you’ll find your answer there. I’m planning to build a 3 storey house in Pinagsama Vilage in Taguig City, is it advisable to build a house ? Is it safe? Many thanks! 200 to 400 years? Prophetic Lies! we will become Zombies By Then as well as Living On Mars! While the question of when will the faults move provides a clearer estimation, Is it possible to measure the magnitudes of an earthquake in terms of the fault line’s length and the depth of the fault from the surface where all of us are living? Can these be factors in determining the strength of an earthquake? Another thing, say East Fault moves. Does this have an immediate reaction to the much longer West Fault all the way to the South West Fault and affects the scratch-like faults further South? Thanking your reply in advance. What about Bulacan? Did it has a fault line somewhere? Hopefully not. How do i know if my house stands on a fault line? I learned that i should build it 3or 5 meters away from it. Where do i get that informatio. Thank you. If the West Valley fault shakes I doubt if anything in the NCR would be left standing I doubt if any bridges within the city can withstand those shocks or for that matter the flyovers and the infrastructure of the mrt/lrt. It is said that the La Mesa dam our major supply of water might collapse….. It would not matter whether you live on top of the fault or 20 km away from it. The whole country is criss crossed with fault lines and we just have to live with the fact that we are vulnerable to earthquakes. Anyway this applies to all the countries bordering the Pacific…. Thanks for this Analysis. It is important to note that the maps used was based on 1992 Aerial photographs. The information that we see is 21 yrs ago. Given the rapid change in the landscape and landuse of Metro Manila the damage that the Marikina VFS could cause could be much more. Thus people should be really aware so that we could prepare. still, the digital method only verified the precision of the placement of the fault lines on the analog maps. i now have the best of both analog and digital! we live in camacho nangka marikina.what about it? nearby nangka high school is about 0.57 km from the nearest faultline on the other side of marikina river. when that thing moves……it wouldnt really matter if you’re beside it or 20kms from it……..a 7+ movement will damage everything w/in 100+kms from it. We live in Angat, Bulacan. I want to know what woulld happen if a strong quake hit Angat Dam and break it. A water flow map will help us prepare our escape route. Thanks from Thom Dulay. on a smaller scale, the 80 year old and retired WAWA DAM in montalban rizal, which is practically abandoned or ill-maintained in the least, and unprotected for terror groups to commit their unholy acts can likewise flood all the municipalities where the marikina river passes before emptying itself in the laguna de bay. the government should inspect the structural integrity of wawa dam if it is prone to break in case of a strong quake. How about c5 road Barangay ususan taguig city, how far from the west fault line? Thanks so much. You have been very helpful in our selection for residence area. But is it already sure that Makati is not included, that is safe to live there? Also, I’m also concern because my daughter is working in one of the Makati buildings, Rufino St. 24th floor. Hi Tulisanes, much gratitude for your excellent work. I have been searching for any comment on Eastwood City (Libis) to no avail. Is is standing on the West fault-line? Salamat po. Thank you for sharing these information to us especially the maps. But I can’t seem to find the place where our charity village for the abandoned children is proposed to be build. We are really concerned. I am using google earth now, and there seems to be that light blue line, that indicates the fault system. I would like to visit Philvocs as well in the very near future regarding our concern. But for now, if ever you can help me, as this are the coordinates more or less of where the site is, 14.746912, 121.156078 . It is in San Isidro, Montalban, Rizal, around 500 meters northeast from Avilon Zoo. If the area is high risk, or that there are things that we should be aware of, anything that can enlighten us before we start building. We have work hard and still working to get the finances and sponsorship for this Charity village and we want our children safe as possible. I hope you can help me in this research, any information will be appreciate. Thank you so much and have a great day. Thank you very much for that insightful blog entry regarding my inquiry, we will surely need more thorough study on this one. I already contacted Philvocs regarding this concern, and they said we are welcome to visit their office anytime. Though, I’m in Ormoc right now, I’ll surely have this in my itinerary when I go back. Thank you very much again and God bless your good heart as well! Thank you for taking time to put these together and made available to the public. I have a growing family and we’re currently looking at a new place to move into. Having seen this made me aware of what places to consider for my next home. Maraming salamat! Is it safe to buy a mid-rise condo near Acacia Ave, Taguig City, Philippines. Location is good and we’re considering investing but its near the east valley faultline. What are the dangers of a magnitude-7 and up earthquake to the east valley side? one, WE ARE WARNED by philvolcs that the west valley fault moving is not a question of if but when. the faultline is due to move soon –soon as, perhaps, in the lifetime of the adult generation living today; that is, if we were interpret the recurrence of the quake every 200 to 400 years and we are now in the 350th year since the last time the west valley fault moved. meaning, by these numbers alone we can surmise that a west valley quake is long overdue, which we can expect from an adrenalin-pumping imminent (like any time now) to happening within the next 50 years to complete another 400-year max cycle. two, the magnitude 7.2 predicted for the west valley fault is similar to 50 megatons of TNT, or “equivalent to that of tsar bomba (50 megatons), the largest thermonuclear weapon ever tested.” remember port-au-prince in haiti that got flattened to the ground by a magnitude 7.0 on jan. 12, 2010? phivolcs hints that when (not if) a 7.2 magnitude earthquake hits metro manila, it can be more disastrous: that while the epicenter in haiti is some 10 kilometers from port-au-prince, the epicenter of phivolcs’ earthquake scenario 08 is WITHIN metro manila. while giving it some serious thoughts, here are pictures of devastated haiti to help drive home the point. three, the frequency and magnitude of earthquakes the planet is experiencing in recent years is crazy and anomalous. i know i’ve used this elsewhere in the blog and, maybe, i’ll use it more till it truly catches on. the following graph is as scary as being on a high-rise during an earthquake and being swung wall to wall, to and fro, up there is much, much –way much more traumatic than being on the ground (this is as officemates on the 8th floor of a 14th floor building recounted during the 1990 quake that toppled the hyatt hotel in baguio)! ok, if i already live near –maybe 100, 200, and 300 meters, or more even, away from but NOT on– a faultline, i can still take it, provided (1) i live where my family and i can dart out of the house quickly in under one minute (of course, after getting protection from under a table or any sturdy furniture or door jamb during the initial strong quake), and (2) i live on a floor where there is not more than one floor slab above me. God forbid if there are slabs and thick slabs of concrete floor above like in units of these condos that can crash like decks of cards; with narrow hallways in between deadly slabs where, with certainty, everyone in panic clogs into in a mad dash for safety outside. imagine the seemingly endless minutes to get down to the ground past a flurry of wild, fear-stricken people also winding down and almost falling to the bottom of the stairwells! four, (this is quite hard to believe specially when crammed into a few short sentences) i believe we are in for some big-time planetary changes that is related to the sun acting up with solar storms starting late 2012, even spewing fiery coronal mass ejections that can be catastrophic if earth is hit. tie it all up to the unprecedented earthquakes experienced around the globe with frequency and magnitudes unfamiliar decades ago. include global warming that is not only happening to the earth but to ALL the planets in the solar system. why this is happening solar system-wide is because the agitated sun and planets are entering a blob of gas ten light years across which NASA scientists call the local interstellar cloud, but which itself is within a much larger expanse of a million-degree hot gas in our milky way called the local bubble…. QUITE A MOUTHFUL, THESE ARE …DEEPER STILL. actually much more than meets the eye. but by my studies these are the real reasons for the abnormal quakes around the world, and all the reasons more why the west valley fault may be about to wreak havoc. if you don’t understand, pls. google my specific keywords above and be prepared to slide down a rabbit hole. “…why are they still building high-rise condos in Fort Bonifacio? Does this mean its safe if you are not on top of the actual faultline?” well, simply this: just follow the money trail. it’s all about big bucks real estate and government corruption. you don’t really believe they’d declare vast tracts of prime real estate as no-building zone where there haven’t been an earthquake on the west valley fault for the past 350 years? but give nature a few minutes and everything may just turn into “sahog” to be mixed in a primordial soup. Thank you very much for the reply and apologies for the delayed feedback. Your insights have been very helpful in deciding a very important matter. We’re really hopeful a 7-8 magnitude quake, should it eventually strike, won’t cause massive damage. Am wondering if we’re the only country that allowed developers to build high-rises near a fault line or is this combination of lax regulation, greed and corruption (assuming these are why high rises were allowed to flourish even with such risks) also brought the same issues and problems in some other countries. You don’t really have to answer that sir, was just thinking out loud why people, companies and government will risk the lives of others to (pardon the pun) make a killing. Anyway, I’d like to ask (and will welcome a reply if it’s not asking to much) if low-rises (say 6-storey development) that are 5-10 kilometers from the fault line are safe enough? truth to tell, i think it boils down to whether one lives in a building that sits directly on top of a faultline or not, meaning ten meters or just next to a faultline MAY be prone to the same destructive effects as a farther distance of, let’s say, 10 kilometers. because when a faultline moves, it literally shreds everything on top of it with usually two oppossing forces just like breaking dry soda crackers in two with many crumbling pieces falling by the wayside. while it’s true the farther one gets from an epicenter, the lesser the intensity and magnitude of an earthquake, the buildings that are subjected to the destructive forces must be sufficiently strong to withstand the intense shaking. keep in mind that the strength with which a building is built, referring to its structural engineering that is quite invisible to the untrained eye, matters much much more than the esthetic considerations that goes into the architecture, and including any idyllic location and tempting pricing schemes a condo agent offers. to answer your question directly: consult a structural engineer about how strong the six-storey development you’re referring to, and make sure you can quickly evacuate yourself and your family SAFELY out of the building, in a given atmosphere of panic, after experiencing the strong initial shock (where earthquake safety cautions one to hide under a strong solid structure like a table till the shaking passes). Thanks for the information. It is just so sad that high rising building is mushrooming in those danger zones and it seems that there is no control because the construction still on progress inspite of the warnings. i feel the same way. i still have to see a news story or a feature on “condo living and earthquakes.” the issue is very obvious. why isn’t anyone talking? Haiti is different from the Philippines.They constructed their houses with out much iron bar to reinforce the concrete aside from bad foundation.Maybe even 4.0 earthquake can make significant damage in Haiti. I can say this because i leave there for 27 years.But this is a very helpful information that can save a lot of live here in Metro Manila.Thank you. as well as Loyola grand villas, la vista, ateneo, UP diliman…..kindly be more thorough when you intend to “broadcast” something. since you’re suggesting something that you recognize which i can’t, maybe you’d want to contribute your time and observation and help me identify these communities in the maps, and maybe others more, too? sort of you’re contributing for the good of humanity (soul-cleansing, too, perhaps). how about it? say yes and i’ll work on how we’ll do it. i’ve always been a firm believer in the idea that when you tear down something, make sure that you have something to replace it that people can build on. i want to involve you. will you work with me? for other readers who also want to help, they can help by sending me screen captures of close-ups of sections of the maps and identify them by naming the file with the name of the villages/communities identified. it will be to my understanding that, at the very vertical center of the screen-captured image is where i’ll put the name as label for the new village/community identified. why are ayala heights , mckinley hills, and serendra/market market not included in your list of “danger” zones? These means the value of the property that lies on the fault will definitely go down. what about other properties along the fault lines you forgot to mention? I think these all need to be mentioned as well. dont you think so? i’ll think so if you think so. well, what i mean is obviously you know these areas better than i do. by the way, i never referred to the subdivisions i spelled out in big letters on the upper part as “danger zones.” i placed the names to serve mainly as points or frames of reference so people would have an inkling of the general vicinity of the faultline. truth is, i never knew these posh villages lie along what you refer to as danger zones. THANKS TO GUYS LIKE YOU who can identify the areas affected and alert the public to them (surely taxi and bus drivers have better luck in naming these areas than i). i picked out these subdivisions from what were already identified and could be read in the outdated philvolcs map. regarding your comment below that i’d be more thorough when i broadcast something, i just couldn’t be anymore thorough after spending more than a month assembling the maps with about three hours that i put in daily. it was nerve-wracking that i later had to force myself to finish the maps! if you create maps this big a size and want them detailed too, there’s a chance halfway through you’ll get stuck in a rut and unable to go on with a case of paralysis from analysis. though even if not thorough as you put it, i think of it as a POINT IN THE RIGHT DIRECTION. i’d rather that people recognize the “thoroughness” in my attempt to make the street names readable while creating the maps with file sizes just under 1 megabyte that you can email easily. a mean feat if you ask any serious graphic artist. Thank you for the information. Unfortunately, I now live on the faultline. If it is serious enough, why are people still given building permits? thank you so much for posting these maps. It’s really helpful and informative. Given the calamaties that’s happening nowadays, we really need to be aware on our surroundings. thanks again and more power to you! Great information you got here. Those in the process of deciding if purchasing in a specific area will now have a more informed decision. Thank you! Actually it is not much for purchasing land with informed decision that i made the maps on this blog (though i’m glad i can help in that area). the maps are there to help those who want to be helped to keep out of harm’s way, particularly people who live or work practically on top of the faultline. even phivolcs tells outrightly it is not a matter of IF but WHEN an earthquake will shake the marikina valley faultline system (mvfs). how i read it: it’s earthquake coming soon…. i found a site that puts into chart all the deadly and destructive earthquakes worldwide between magnitude 6 and 8 that occured in the past century, from 1900 to 2008 (i wonder why it stopped there), with the UNITED STATES GEOLOGICAL SURVEY as source of data. the abrupt spike in the rise and frequency of destructive earthquakes since the start of the millennium is just unbelievable. it just increases the chances of the mvfs moving soon. Thank you for sharing this Info.Who knows how many more lives this info could save. Lets all share it to our love ones . Thank you very much for sharing. Question po, naitanun na ito before pero wala po clear answer ako nahanap. Affected po ba yun Sta. Rosa Laguna E.g. Nuvali? Please advise po! Thank you so much for a very detailed compilation of affected areas. I hope that many lives will be saved by this information. More power to you! thanks a lot for your awesome compilation of detailed affected area in the future. hi, thank you… this is very helpful… so it’s not true that it will extend up to Sta Rosa, Laguna? i’m not familiar with the area, but i did some checking on google earth with an overlay of the fault trace. to give you a picture of where the faultline lies, try zooming in on the area (where the west fault ends), locate the PNR muntinlupa station, the PNR carmona station, and the de la salle canlubang. imagine a line connecting those points and there the faultline crosses –but not a neat, straight line really; more like a series of inverted “V” tracks that become parallel lines for some distance, then to join again to form a letter “V” after de la salle canlubang. basically what this shows, after jumping from the map mode to the aerial, real view of the satellite mode, is that the faultline for the most part crosses rugged, green country. though the heavily populated area are way over to the right of the faultline, there appears to be some subdivisions with houses scattered far and wide from each other across many vacant lots through where the faultline passes. it also appears the fault trace just stops after de la salle canlubang. though relatively very near the school, the faultline DOES NOT pass through the school grounds. by the way, “sta. rosa city” can be read at the center of the heavily populated area i referred to earlier –my basis for citing the above for your sta. rosa question. I’m really bad with maps and I’m not very familiar yet with QC because I live in Bulacan for now. Is Tandang Sora, near a faultline? i live on top of a fault line. Should I consider moving? Would having my house checked by a civil engineer, do some improvements to strengthen the structure suffice?